The Ohio Buckeye tree(Aesculus glabra) is the official state tree of Ohio, and Ohio is known as the Buckeye State. Although the Buckeye tree is quite common in Ohio, the origin of the name comes from a September 2, 1788 meeting of the first court in Ohio in the Northwest Territory. Colonel Ebenezer Sproat was the leader of the court(and therefore Ohio's founding father). He was an imposing man for the time at 6 ft 4 in, and very well built. The Indian chiefs in attendance chanted "Hetuck, Hetuck", a symbol of respect towards the Colonel. Hetuck was the Indian word for Buckeye, literally meaning "eye of the buck". The Colonel was proud of the title and eventually it spread to his fellow Ohioans, becoming a common term by 1830. In 1840, William Henry Harrison of Ohio ran for President and won, using the buckeye as his campaign symbol, sort of like a button would be used in later times. The state flag of Ohio draws heavily on the Buckeye. The scarlet circle represents a Buckeye, and is surrounded by an O representing Ohio. There are 17 stars representing that Ohio was the 17th state, and four stars are set apart because Ohio was the 4th new state to join the Union. The Buckeye has been incorporated heavily into Ohio State logos as well. 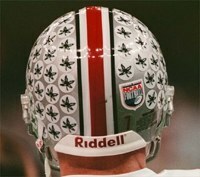 Below you can see an example of a logo with the Buckeye, and the Buckeye leaf helmet stickers which were introduced in 1968 by Coach Hayes. And of course, mascot Brutus IS a Buckeye.